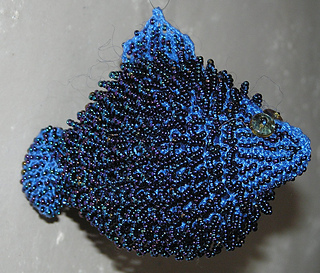 Knit from tail to head, this Fantasy Fish is worked flat in bead knitting. The bead loops simulate the look of scales and add a wonderful dimension to a fish found only in the imagination. 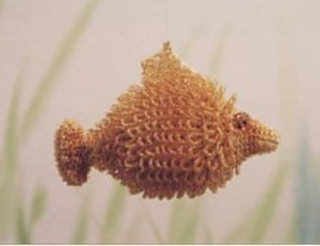 The dorsal fin is picked up and knit onto the body. There is only one seam. These little guys make cute Christmas ornaments, too! 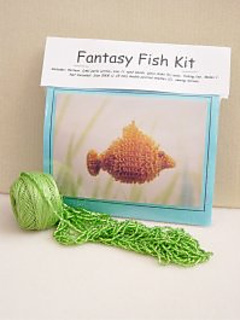 One hank of seed beads and one ball of cotton will make one fish. Instructions for transferring beads and bead knitting included. Kits available from FiberSpace. Call 877-467-0382 for details.